Are you an arts junkie? 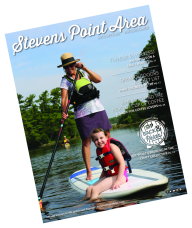 This itinerary will help guide you through an eventful day as you discover the various types of art the Stevens Point area has to offer, from making your own pottery to visiting local galleries to taking in engaging theater productions. The itinerary also provides a few helpful hints to finding some great places to eat. Start the day with some arts and crafts at Clay Corner Studio, located in the heart of downtown Stevens Point. Venture just across the street to The Coffee Studio, a local favorite known for its ham and cheese paninis with cranberry mayo. Explore the connection between nature and art as you take a leisurely stroll along a scenic trail at the Stevens Point Sculpture Park. The park holds live performances and educational programs and offers an opportunity to see artists in action. Or, absorb the local art scene at the Gallery Q Artist Co-op, a fine arts co-op owned and operated by local artists. Take in its monthly exhibitions, including sculptural pieces, 2D, photography, interactive art, artist meet-and-greets and occasional poetry readings. Visit the Noel Fine Arts Center on the UW-Stevens Point campus to inquire about their numerous shows ranging from theatre to dance productions. Café Junkie? Visit two more of our local favorites: Zest and Emy J’s. Each provides its own unique atmosphere. Enjoy sandwiches, espresso drinks and smoothies. Grab dinner at Michele’s Catering & Restaurant, known from its diverse menu of local and international cuisine. Then, be entertained by a production from the UW-Stevens Point Theatre Department.